While this is only April, Disney's live action version of The Jungle Book is the best film of the year. The 1967 animated movie was the last film produced by Walt Disney. He passed away before the movie was completed and personally, I found it to be among his lesser features (alongside Alice in Wonderland and Peter Pan -- the latter of which works as a stage play but never in film). The original concept created by his animators and songwriters was darker in tone but Disney insisted on a more lively and high-spirited rendition. Perhaps his death inspired the animators to complete the film as Uncle Walt insisted. The movie was financially successful for the Disney company in 1967 and may have been more successful had the film retain the initial concept of a darker tone. Only historians can speculate. In case you have not seen the 1967 original in some time, the vultures spoofing The Beatles only adds age to the picture. The saving grace was Phil Harris as the voice of Baloo the bear, which I assume many will agree with me. 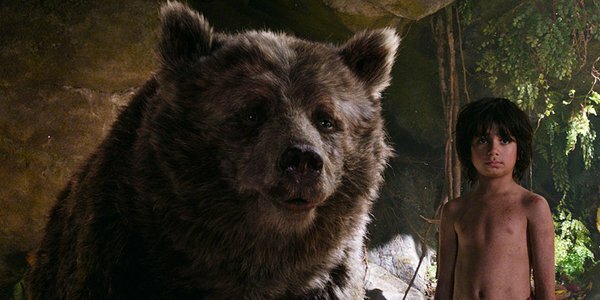 With Disney's new live action rendition Bill Murray, who receives top billing, voices Baloo and does a job equal to the task. In fact, all of the actors providing voices did a spectacular job and Idris Elba, voicing the villainous Shere Khan, is fast becoming one of my favorite actors today. 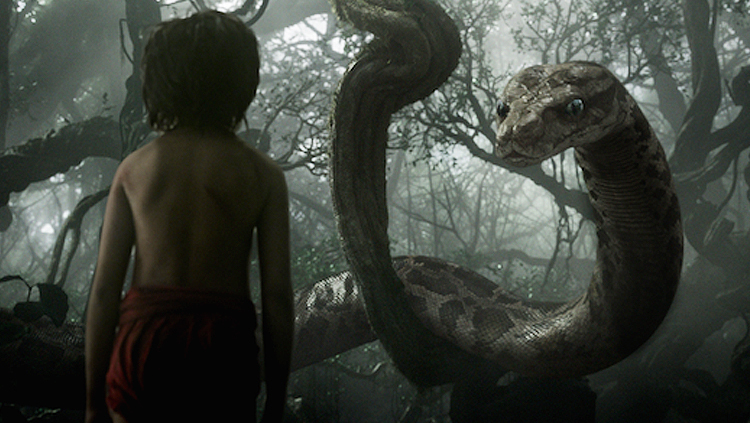 Neel Sethi makes his screen debut as young Mowgli and he was perfect for the role. You can see this kid has a future if he sticks with Disney for a few years. For anyone who remembers the live action version in 1994 and the direct-to-video animated sequel in 2003, you'll be pleased to know that this follow-up to the 1967 movie proves the adage that the third time is the charm. You do not have to see the 1967 original to enjoy this picture, but knowing "The Bare Necessities" and "I Wanna Be Like You" songs, which are reprised for the new movie, is a plus. 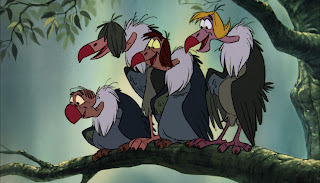 And the vultures, sans The Beatles impersonation, make a quick cameo. Don't try looking for them. You'll see them. If I read the closing credits properly, the movie was never filmed in the jungles of India. 100 percent of the movie was filmed in a warehouse in Los Angeles. Unlike Star Wars: The Force Awakens that applied puppets and costumes and props, this movie relied heavily on green screen. I would estimate 99 percent of the movie was green screen. Replicating reality has been an argument fought against by those in the industry who rely on their trade. Unless Mowgli had to jump over a log, slide down a muddy hill or climb a tree, there was little constructed in the physical sense. With knowledge before me, the trailer promoting this movie did not impress me. But my curiosity was piqued. The problem with computer-generated animals is that they never have the natural mannerisms that real animals have. Nor the intricate details such as 4,000 strands of hair on a wolf or tiger. The computer-animated renditions always look like a cartoon. 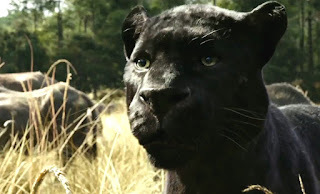 In The Jungle Book, the computer-generated animals are the best I have ever seen. The bar was raised and whatever money Disney paid to have such top-notch computer effects, the studio got their money's worth. While I have made it known that I am not a fan of 3-D, my wife and I agreed this was the best 3-D movie since Avatar. Director Jon Favreau understood depth perception and there are moments where you really feel you are in the jungle. With Alice in Wonderland, Cinderella and Maleficent as live-action adaptations of Disney's animated classics, with an applied darker tone that did not fare well with many critics, I am pleased to say The Jungle Book is a winner on all sides. I have always asked for one thing when watching today's movies: if you cannot impress me, entertain me. Disney accomplished both.